Do you suffer from painful feet? Is the pain especially in your heels when getting out of bed in the morning? You might have plantar fasciitis, a painful condition that affects the heels of the feet. Heel pain is one of the most common clinical conditions that bring patients into the office of a foot specialist. Presenting as heel and arch pain that is particularly worse when getting out of bed in the morning, or after a period of sitting and then standing, fasciitis often causes one to start a search for proper diagnosis and treatment options. Plantar fasciitis is a term that connotes an inflammation at the area where the plantar fascia, a long, strong ligamentous structure located on the bottom of the foot, attaches to the heel bone. The pain could be from a localized inflammatory process if the injury is acute, to chronic degenerative changes if the pain has been going on for a while. I often hear people say, “My heel spurs are hurting.” The spur is a radiographic finding. It is caused by a constant pull of the fascia onto the heel bone. How does one get plantar fasciitis? The answer is not so simple. This condition can occur in almost anyone in the population from teenagers to senior citizens. It affects everyday runners, weekend warriors, and home health aides and teachers that spend many hours a day on their feet. Biomechanical etiologies such as foot/arch type, functional processes including tightness of the achilles tendon and calf muscle, as well as overuse injuries are all factors that contribute to increased local stress at the plantar fascia insertion. In my opinion, almost always, plantar fasciitis is connected to tightness of the achilles tendon and muscle group in the back of the leg. Many times, it can present with pain in the back of the heel as well. This is known as Achilles tendinopathy. Non-surgical treatment usually entails stretching exercises to loosen the plantar fascia and achilles tendon. This often can be done at home but can include a specific protocol with a physical therapist. Other modalities include proper supportive shoe gear, off-the-shelf or custom foot orthotics, NSAIDS like Motrin, night splints and steroid injections to relieve the pain. It’s important to note that the injection will help the pain, but not treat the underlying problem. Often, patients come to my office after receiving several of these. Unfortunately, in some patients, symptoms persist and the problem prompts additional treatment and a step up in therapy. Imaging modalities such as an MRI or an ultrasound are very helpful in identifying any tear or degenerative changes in the plantar fascia. It can also make sure the pain is not from another cause, such as entrapped nerves or a stress fracture of the heel bone. With real-time ultrasound imaging, the physician is able to locate pathologic thickened scar tissue and perform precise tissue and fascia removal while sparing healthy tissue with built-in safety measures and sensors. This minimally invasive procedure can often be combined with PRP (platelet rich plasma) or cryopreserved amniotic membrane injections, both of which help create a local inflammatory response rich in growth factors that aid in the body’s own healing mechanism. Recovery is typically two to three weeks in a walking boot with partial weight bearing. If you suffer from heel pain, and treatments such as physical therapy, cortisone injections and orthotics offered minimal to no relief, consider trying Tenex. If you would like to know more about the Tenex procedure, please call our office to set up a consultation. 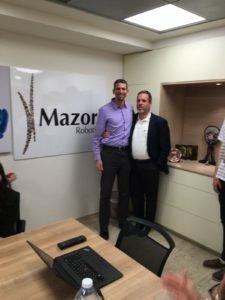 Dr. Jonathan Lewin was invited to the global headquarters of Mazor Robotics, Ltd. in Caesarea Park, Israel on October 19, 2016. The headquarters are home of the Renaissance® Guidance System and the new MazorXTM Surgical Assurance Platform. 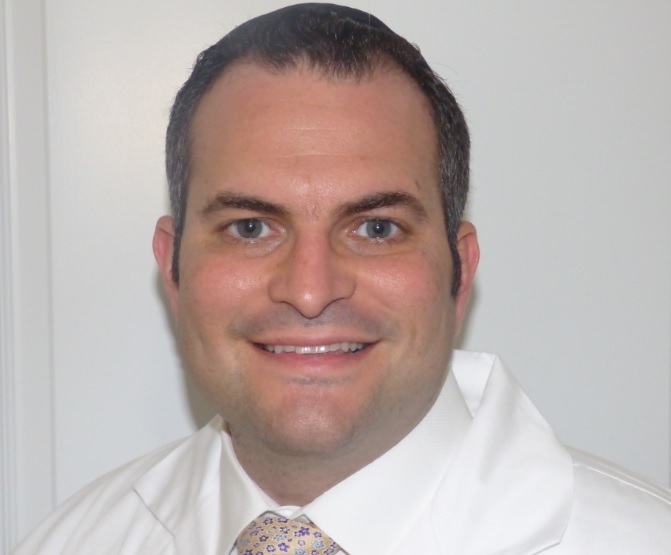 Among the executives with whom Dr. Lewin met is Mazor Robotics CEO Ori Hadomi. Hadomi is a long-time financial and business leader in the medical technology field. The purpose of Dr. Lewin’s visit was to enhance his relationship with Mazor’s senior executive leadership team. While there, he toured the company’s executive offices, as well as the R&D and manufacturing facilities at Mazor Robotics, Ltd. 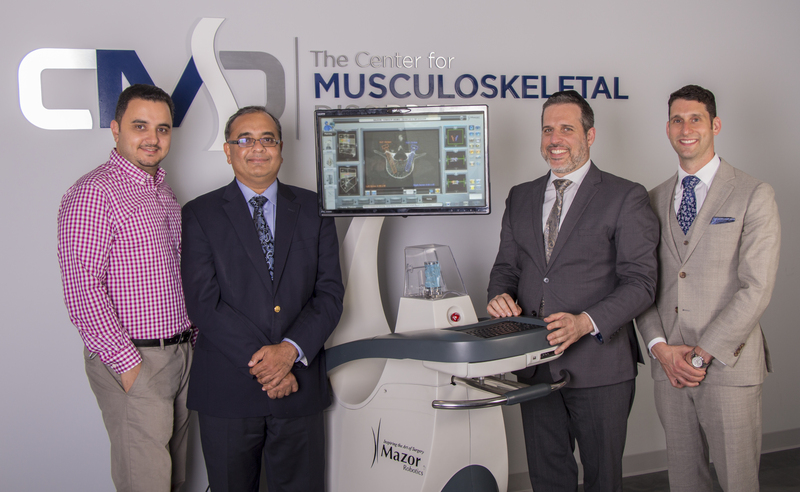 The Center for Musculoskeletal Disorders (CMD) acquired the Renaissance Guidance System on September 27, 2016. Among the continuing groundbreaking procedures CMD is achieving with the Mazor technology, the CMD team of surgeons performed the first in-office robot-assisted kyphoplasty with the patient under sedation—but without the use of narcotics. 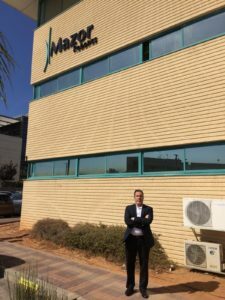 The procedure was performed on October 31 and was the first of its kind in the U.S.
Dr. Lewin stands outside Mazor’s global headquarters located in Caesarea Industry & Business Park. The Park is a unique campus comprised of 180 leading Israeli companies engaged in anything high-tech from biotechnology to medical devices to water technologies and more. 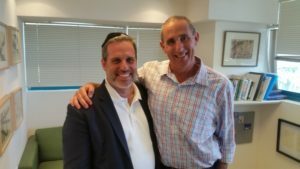 Dr. Lewin with Doron Dinstein, MD, MBA. Dinstein is the CMO of Mazor Robotics. A medical doctor with an MBA, he is part of the medical and business “brain trust” of the company. The Center for Musculoskeletal Disorders Performs First-of-Its-Kind Surgery in the U.S.
There’s nothing more painful than a spine fracture. At The Center for Musculoskeletal Disorders (CMD), we know that from experience, treating our patients. Recently, our practice used the latest and best in modern technology to provide relief to a 52-year-old woman who came to us with unremitting pain from a T12 fracture (a compression fracture in the bottom part of the spine). Since she had experienced no respite from medications or a thoracolumbosacral orthosis brace (TLSO)—a corset-style brace to stabilize movement of the torso—a procedure was indicated. Thus, our patient became part of a unique event in the field of spine surgery, which occurred at CMD on October 31, 2016. The CMD team became the first in the U.S. to perform a robot-assisted kyphoplasty in an office-based setting under sedation, allowing the patient to return home the same day. A kyphoplasty is a spine procedure to repair an injured or collapsed vertebra in order to relieve pain and restore the original anatomy. The CMD team consisted of surgeons Dr. Vagmin Vora, Dr. Seth Grossman and Dr. Jonathan Lewin, as well as Isaac Abramchayev, PA.
Dr. Vora reports that the surgery progressed very smoothly, with the Mazor robot localizing the bone entry site within a tiny fraction (0.38 millimeters) of accuracy. The patient left the surgical suite only two-and-a-half hours after the completion of the procedure and is recovering without any issues. Mazor Robotics (TASE: MZOR; NASDAQGM: MZOR) believes in healing through innovation by developing and introducing revolutionary technologies and products aimed at redefining the gold standard of quality care. Mazor Robotics Guidance Systems enable surgeons to conduct spine and brain procedures in a precise manner. For more information, please visit http://www.MazorRobotics.com. The Center for Musculoskeletal Disorders (CMD) is a formalized joint practice including The Center for Spinal Disorders, The Center for Hand Disorders and The Center for Pain Management. Since the three centers have long worked together to provide cohesive care to the community, our newly integrated practice will continue our steadfast servitude to our patients. Our specialty-trained physicians and staff share the common philosophy of highly personalized care. We stress non-surgical solutions whenever possible and use cutting-edge medical and surgical techniques to customize advanced treatments for our patients’ needs. 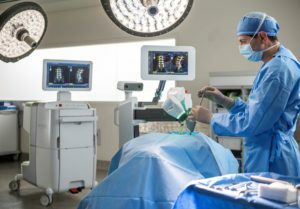 We have introduced robotic spine surgery as one of our many innovative techniques for effectively performing spine surgery. With the help of robotics, our practice plans to reduce human error even further during procedures. We also anticipate shorter recovery time for patients and a quicker return to function. Discover the future of robotic surgery at CMD in the video below. The use of robotics in the medical field has been gaining ground over the last 10 years. Presently, in particular in spine surgery, its greatest use appears to be in the application of screws. Traditionally, this has been done using an open-handed technique, in which a surgeon will rely on his knowledge of anatomy and the appearance of the vertebral bones as a patient lies on the operating room table, in an attempt to accurately place screws. In particular, this is common for fusion surgery. In addition, the use of fluoroscopy or x-ray helps to guide the accuracy of screw placement. However, despite the surgeon’s best attempts, accuracy often suffers. As a matter of fact, studies show that up to 5 percent of screws placed are done so in an inaccurate fashion and will need to be revised. The use of robotics in spine surgery, both in practice and in theory, enables a higher degree of accuracy for instrument and screw placement. This is done via a CAT scan image of the preoperative spine, which is then matched to the on-the-table appearance of the patient in question. With the use of this type of technology, some studies are showing a 98 percent or greater accuracy in the placement of screws. An additional benefit is that given the technology, the use of radiation within the operating room field is reduced. As of now, only a small percentage of spinal surgeons, and hospitals, have the training, facility and equipment to engage in robotic spine surgery. New Jersey, for example, has only two such institutions. An article in Becker’s Spine Review noted that as of January 2015, there were approximately 70 spinal surgeons who were trained in, and currently using, robotics. As with all new technologies, its appropriateness needs to be evaluated on a case-by-case basis, as well as on a pathology-by-pathology basis. For example, a simple sciatica discectomy-type surgery, in all probability, does not necessitate the use of robotics, whereas for a spine that is curved, in which there would be an attempt to minimize the surgical invasion, robotics could be of great help. Here, at the Center of Spinal Disorders, we attempt to appropriately utilize this as well as other new technologies, on an individualized basis, to customize treatment to best suit your particular needs. Please do not hesitate to contact us with any questions and/or concerns. We look forward to hearing from you and are wishing you the best of spinal health! Recently, we wrote an article concerning the advancement of robotics in the State of New Jersey. Within this article we gave a broad overview in terms of its application towards spine surgery. This has generated significant interest both within our community, and beyond. It was brought to my attention that this article appearing in The Link was one of the top search engine articles appearing to random web surfers seeking information on spine surgery in New Jersey. Our commitment toward the advancement of robotics is so strong we recently completed travel with our entire spinal surgical team to Orlando, Florida. It is there that Mazor Robotics has its training ground and laboratory as well as didactic headquarters. Our experience as a group was outstanding. We collectively completed advanced training on the Renaissance as well as an introduction to the Mazor X Second Generation system. I would like to make my position clear on this technology. This is not about Battle Star Gallactica or Star Wars–like hype; rather, this technology, in our group’s opinion, will allow an integration of the anatomic, scientific and surgical knowledge, on which we have been trained, to be applied in the platform of robotics. This should enable better surgical results, great screw accuracy and less overall use of radiation. One concern that has been voiced by surgical groups is that it will lead to the creation of lesser or less cautious surgeons. I would like to address this. The robot will never replace a human being, in the same way that a pilot who is trained on manual landing will not be replaced by the 777 Boeing landing computer platform. The pilot as well as the surgeon will always need to be engaged—the surgeon, in the placement of spinal hardware or in bone cutting onto the spine. Utilizing the robotics platform, the surgeon is forced to preoperatively plan and preoperatively coordinate in conjunction with the robot. The robot will then enable the greater screw and bone cut accuracy in the operating room. In summation, this will make better doctors, not lesser surgeons. We are even more excited and committed toward the advancement of this technique, particularly now, after our latest excursion, and we will hopefully, in the near future, be announcing a more formal collaboration. In the meantime, please remember, we are committed to your spinal health so do not hesitate to contact us with questions and/or concerns. 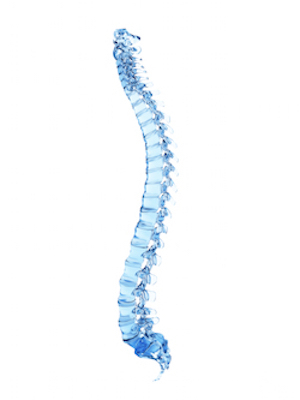 The spine is a very complex structure. There are dozens of muscles, ligaments and tendons, which support the spine. Keeping the spine flexible, well supported and in proper alignment is vital to ensuring a healthy, active lifestyle. Stretching and strengthening routines can help. 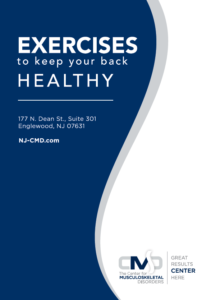 Take a look at Dr. Grossman’s exercise guide for instructions that will keep your back healthy.